The Russia Investigations: Mueller Indicts The 'Internet Research Agency' Here are five takeaways from the indictment unveiled on Friday that charged a St. Petersburg troll farm and a number of individual Russians with waging "information warfare" against the United States. This week in the Russia investigations: A major new indictment from the special counsel's office that charges thirteen individuals and three companies and shakes up the political rhetoric as new facts are revealed in the sprawling imbroglio. Justice Department special counsel Robert Mueller prefers to let his work do the talking for him. On Friday, he delivered a stemwinder. Thirteen Russians and three Russian entities were indicted by a federal grand jury in connection with the attack on the 2016 election. The indictment lays out a number of detailed allegations against the Internet Research Agency located in St. Petersburg and against individuals who owned, controlled, funded or worked for the organization. Much of what Mueller's office charges — that influence-mongers used Facebook and Twitter to turn up the volume and pit American against American — was already public. But the 37-page indictment also includes a number of fascinating new insights. 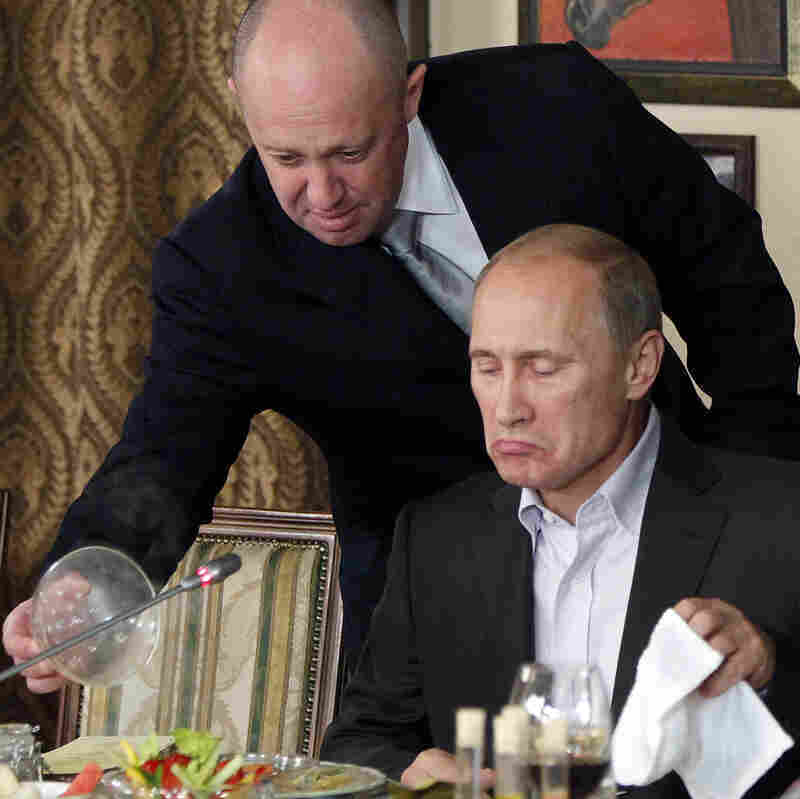 In this Nov. 11, 2011, file photo, Yevgeny Prigozhin, left, serves food to then-Russian Prime Minister Vladimir Putin during dinner at Prigozhin's restaurant outside Moscow, Russia. Friday, Prigozhin, along with 12 other Russians and three Russian organizations, was charged by the U.S. government as part of a vast and wide-ranging effort to attack the 2016 U.S. presidential election. Then-FBI Director James Comey told Congress that Russia launched cyberattacks against a wave of targets in the United States as early as 2015. But the indictment on Friday traced the origins of the Russian interference operation even earlier — to May of 2014. Why is that important? The revelation confirms the geopolitical context in which Russian President Vladimir Putin decided to place his chips on a major new influence campaign against the West. In 2014, he was angry at what he perceived as American meddling in Ukraine, in his own front yard. A scheme from that year in which Russia leaked a wiretapped phone conversation with an American diplomat has proven to be its own little preview of 2016. Placing the origins of the Russian effort that far back in time also raises new questions about what President Obama's administration knew about what was happening. Were they aware? Did Obama and his aides look the other way from Russia's actions in order to protect other aspects of the relationship such as the international deal to restrict Iran's nuclear program? 2. Russians didn't just post from afar. They traveled to the U.S.
At least three Russian operatives physically traveled to the United States to do reconnaissance for their active measures campaign, according to the indictment. They traveled throughout the West, South and Midwest, to New York and elsewhere. That led to the tracking and study of American political organizations that later matured into the sophisticated targeting of certain groups during the 2016 election cycle. For example, black voters later were encouraged not to vote for Hillary Clinton by messages suggesting they not vote at all or that they vote for a third-party candidate. Anti-Muslim groups were encouraged to stage rallies and so on. Russian operatives also bought space on computer servers within the United States. That enabled them to connect from their headquarters in St. Petersburg and, using a virtual private network, post on Facebook and Twitter while appearing to be inside the United States. The fact of the travel of Russian operatives also raises questions about other aspects of the influence campaign. How many meetings might have taken place between intelligence officers or their agents and American political organizations that might have been infiltrated, for example? And will stories about Russian spies actually prowling around the U.S. — not just posting from behind a firewall somewhere overseas — change the politics of punishing Russia for its interference? Trump has been criticized for not imposing stronger sanctions after they were put into law last year by Congress. Russian influence-mongers corresponded with a number of Trump campaign workers and even paid some Americans to show up for protests they organized, the indictment alleges. They hired a person to buy a cage and paid another to stand in it pretending to be Hillary Clinton — part of the push to "lock her up." Mueller's indictment says none of the Americans knew they were dealing with Russian operatives, but they nonetheless provided the Russians with some important help. For example, in June of 2016, Russian operatives began talking with an American "affiliated with a Texas-based grassroots organization. During the exchange [the Russians] learned ... that they should focus their activities on 'purple states like Colorado, Virginia and Florida.'" This insight, which might appear obvious to Americans, was treated as a major gem by the Russian influence operatives. Remember, these were foreigners trying to understand how to target a foreign land. It also helps explain another avenue through which they tried to influence the presidential race: cyberattacks on state elections systems. The Russians might have wanted to know, simply, what those systems were, what information they contained and how they might have been able to exploit them. As outsiders they might not have known or trusted that a lot of voter information was already public in lists bought and sold by political campaign professionals. 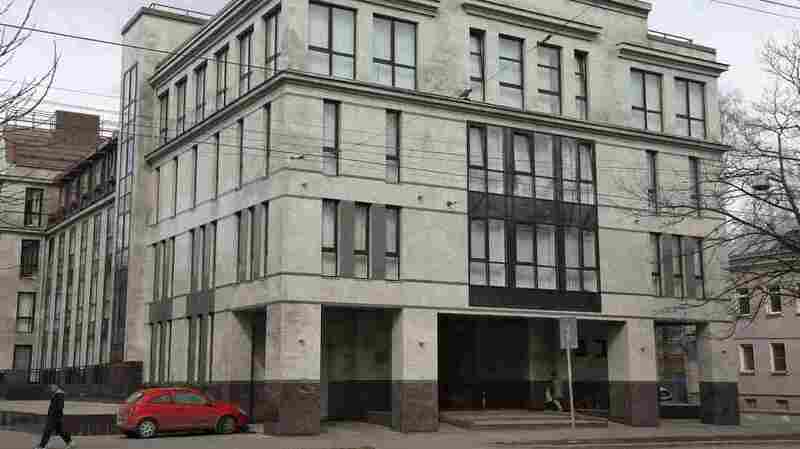 In this file photo taken on April 19, 2015, a women enters the four-story building known as the "troll factory" in St. Petersburg, Russia. The U.S. government alleges the Internet Research Agency started interfering as early as 2014 in U.S. politics, extending to the 2016 presidential election. President Trump has gone back and forth about what he accepts and what he rejects about the Russian active measures campaign. On a trip to Asia, the president said he believed Putin believed there was no election interference. The indictment on Friday, complete with an on-camera announcement by Deputy Attorney General Rod Rosenstein, took away much of Trump's room to maneuver. So the president conceded the fact of the attack while modifying his position again. For the purposes of this news cycle, the indictment brought good news for Trump and the White House. Rosenstein emphasized the charges did not include allegations that any Americans knowingly went along with the Russian attack. And the start date for the effort in 2014 gives Trump and allies a political weapon if they want to make a point of asking why Obama, Secretary of State John Kerry and others didn't do more to stop it. The longer-term outlook for Trump is muddier. Mueller has now documented many contacts between Trump aides and Russians, both witting and unwitting, not including the much-discussed contacts between Trump aides before and after Election Day in 2016. Although the indictment was politically beneficial for Trump in the near term, or at least fell short of targeting another campaign aide, there — as always — is much more to the Russia imbroglio than any one document or news story. Russia isn't going to extradite the people indicted on Friday by the grand jury. There will be no status hearings or jury selection or opening arguments. The indictment was about Mueller showing everyone — Americans, Russians and the White House — how much he knows and that he, the career prosecutor, believes he can prove it in court. Consider this: The FBI and National Security Agency not only say they can prove a Russian conspirator traveled to Atlanta from around Nov. 26 to Nov. 30, 2014, they know he or she filed an itinerary and expenses. Or this: The feds and their spy allies not only know about the official work these influence-mongers were doing at the office, they also intercepted personal emails like this one from Irina Kaverzina, around Sept. 13, 2017: "We've had a slight crisis here at work," she wrote, "the FBI busted our activity (not a joke)." The indictment goes on and on in that level of detail. Meaning what? For one thing, the charging document pushes "hoax" and "witch hunt" out to the periphery — even Trump had to change his tack in response to Mueller's sometimes Jesuitic specification. For another, the indictment immediately inspires guesswork about what else the FBI, NSA, CIA and other agencies know about active measures that wasn't included — or which might appear in potential future documents filed by Mueller's office as his investigation progresses.